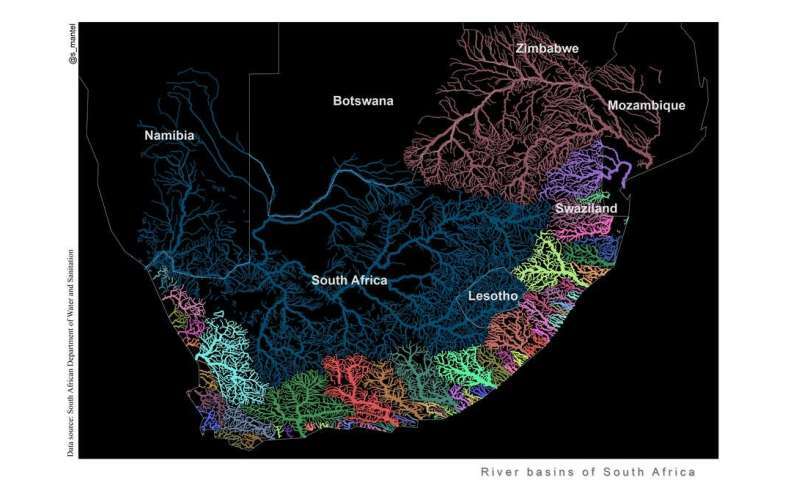 We have spent a lot of time considering these questions and others related particularly to maps since a map of southern Africa's rivers that one of us, Sukhmani, created and posted on Facebook. The post went viral. And though it didn't start out strictly as "science" – it was created on a whim after seeing a map of US rivers – the map has provided us with valuable insights into how scientists and researchers can use maps to engage with broad audiences beyond the usual journals and conferences. Essentially, maps can show "the big picture" to a great many people. They can tell people an enormous amount in an engaging and often colourful way, revealing everything from real and hypothetical voting patterns to the layout of a region's rivers. Maps have fascinated people for centuries. In recent years, research has shown that they can elicit emotional responses. After all, maps are inherently political. What we see on a map either aligns with our view of the world, or doesn't. When it does, we share the map because it confirms our beliefs. When it doesn't, we hit "share" because we want others to see what we're criticising. Maps are also inherently incorrect, and can be misleading. This is because they depict three-dimensional earth on a two-dimensional space. We cannot (yet) capture all the detail of earth's surface in a single map. It's also important to remember that maps aren't perfect. They can contain errors, or leave out information that would help people understand what they're seeing. Second, respondents found the river map as aesthetically pleasing. One person noted that, had such a map been available when they were in school, it would have made learning geography more memorable. This is another reminder that art, in many forms, can bring "unseen" elements of science and nature to diverse audiences. Third, respondents indicated that the map helped them understand the distribution of the rivers and the land over which water flows in southern Africa. This group was interested in how the map visualised boundaries and connections between rivers and land and sea. One person wrote: "Correlation between the mountain ranges and watersheds is easily observed on this map, even without the topographic information." Of course, not all content that ticks these boxes will go viral. But, as public engagement becomes more and more important to society, it's useful for scientists to know what can work. Stylized watershed maps would make good local art pieces as well.